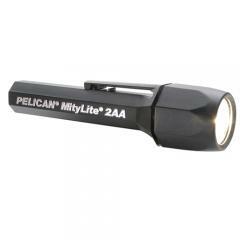 The Mitylite is made of Xenoy/Polycarbonate unbreakable chemical resistant resin material. Its focused laser spot Xenon beam can cut through smoke, fog and rain making it a perfect light source for all applications. Accidental turn on and mechanical switch failure is eliminated because of the rotary on/off switch. It includes 2-AA cell alkaline batteries and is water resistant (not for diving applications). The Mitylite 2AA is FM, CSA and MSHA approved. You break it, we replace it... forever.